"The yellow sandstone structure and beautifully carved balconies of Gorbandh Palace go perfectly with the feel of the 'Golden City' of Jaisalmer. 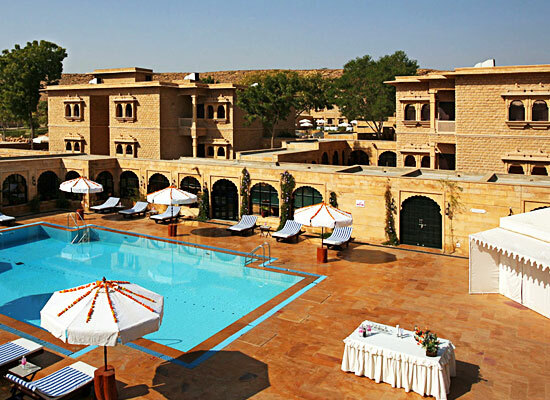 It is located on the route of the well-known Sam Sand Dunes and is one of the most popular heritage hotels in Jaisalmer. During your stay, you can avail several contemporary facilities in a calm ambiance. This heritage property is ideally located in the city with its name being inspired by the desert and other related stories. Gorbandh refers to a harness that is decorated with buttons, colorful threads, beads, sequins and shells by desert women for the camels of their husbands as it is a proud thing for them. It is a mark of honor for the animal and their hardworking men who work in the desert. 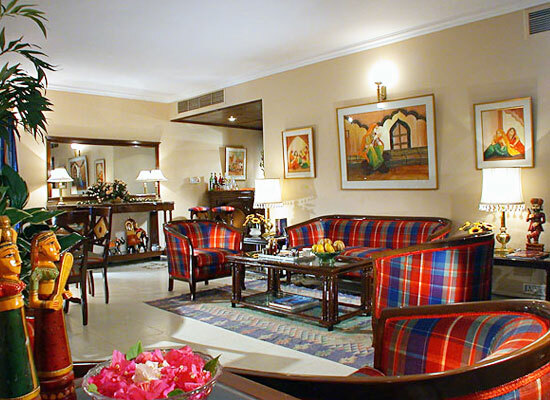 Gorbandh Palace Jaisalmer has a total of 83 guest rooms that are divided into Suites (3) and Deluxe Rooms (80). These air-conditioned guest rooms are well-adorned with all kinds of world-class amenities and services such as internet, room heater, spacious attached bathroom with toiletries, daily newspaper, regular hot and cold water, mineral water bottle, satellite TV, telephone and much more. 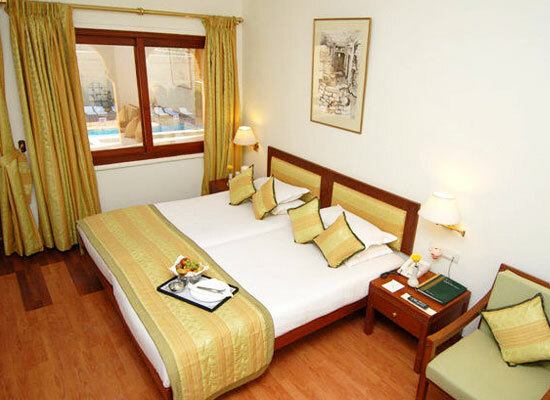 The suites and 8 deluxe rooms have private balconies and Connecting rooms are also available. 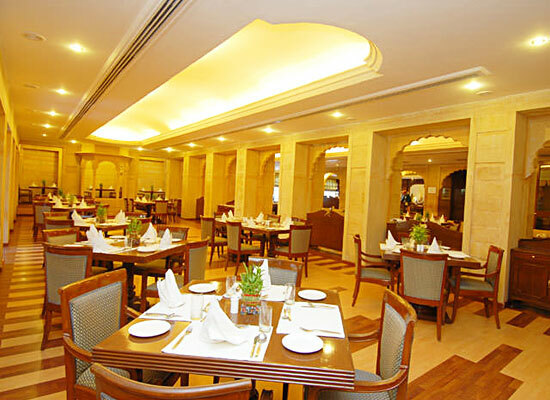 The on-site restarted, Rasoda, referring to a ‘traditional kitchen’ offers mouth-watering authentic specialty Rajasthani cuisine during lunch and dinner. A well-stocked bar, Madhushala, referring to a traditional Indian bar, it serves a vast range of drinks along with light snacks. Enjoy your drinks while soft music is being played in the background. An open-air garden restaurant to relish tasty meals. The poolside restaurant to relish lip-smacking food while admiring the beauty sprinkled around. A coffee shop to enjoy beverages and some quick-bite options. 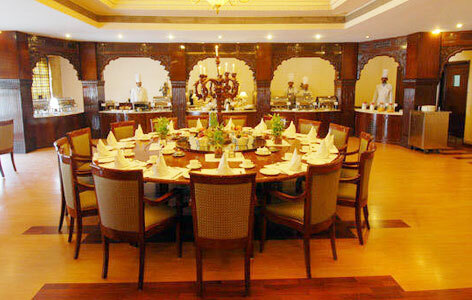 Located alongside the Deluxe rooms, this restaurant offers a range of Indian and international cuisines. Jaisalmer is a beautiful desert city in the royal state of Rajasthan, nuzzled in the foothills of Trikuta. The place is extremely popular for its magnificent havelis, forts and palaces with striking Jali work (lattice work), and intricate carvings. It is also popular for its resplendent Jaisalmer Fort and local bazaars.